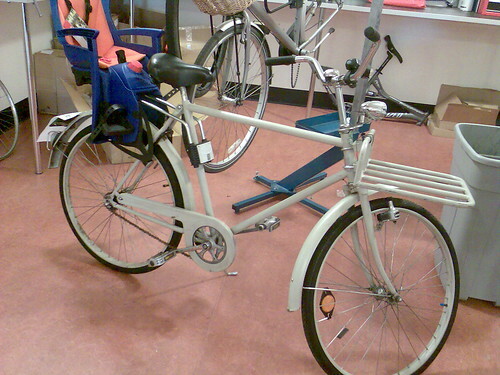 I am a fan of the off-beat - vintage, recumbents, workbikes, and other alternatives. If you've seen anything curious (i.e. not just another Trek hybrid in London ), list it here - preferably with a photo. 1. Garratt Lane turning into Fountain Road. I turned right into the road ahead of a bike turning left. He passed me quite quickly, despite being an older bloke dressed in ordinary clothes. Not a surprise, particularly - I've not been worrying any TT record holders today. I noticed the man was riding an Airnimal - Chameleon, I think. But it had a big rear hub, and something on top of the main tube. It became apparent when he started to 'freewheel' - it had electric assist, which I thought was very interesting for a high-end folder. He turned into the grounds of St Georges Hospital. 2. Parked next to me at the Sheffield Stands east side of Tooting Broadway (OK, I didn't travel far today - what do you want - blood?). A lichen green bike, with 531 stickers on the forks, and a mixture of Shimano components (RSX & Tiagra). 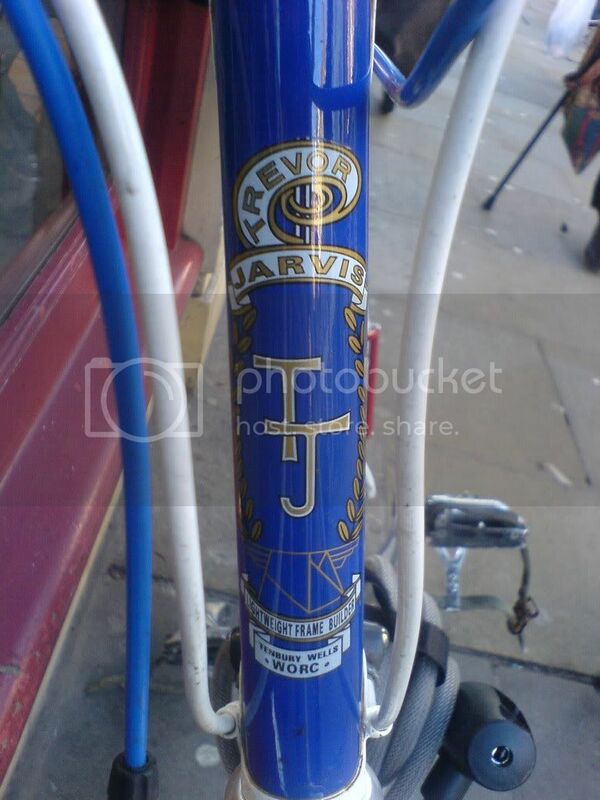 No head badge visible, and the rust was showing through the paint all over, but the conical seatstays looked pretty classy. I'd resigned myself to not knowing what it was, when, from a distance, as the light caught it, I saw the faint remains of the lettering 'Witcomb'. I smiled & rode away. 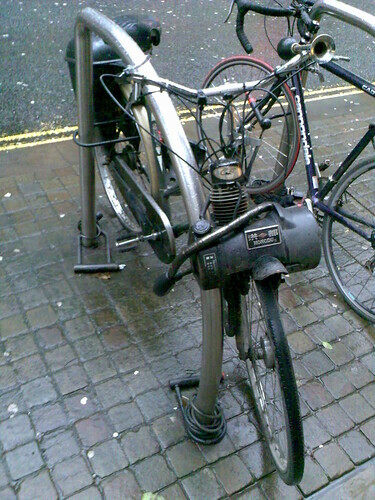 Seen ages ago, but by far the most unusual bike I have seen out and about. Love those Flying Gates (not just cause Baines was a Bradford firm). And TJ (Trevor Jarvis) is based near my parents' house. I dunno. Interesting yes, but I've always felt they were just trying too hard to be interesting. I'd prefer something a bit more understated meself. I think this thread need a link to the XnTRICK Cycles website. Oh - and now it has! 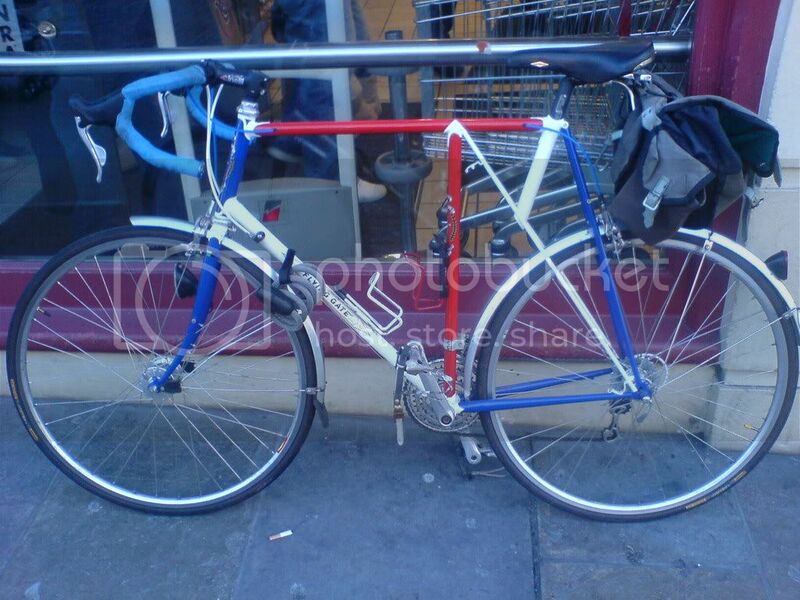 I saw a Overbury MTB in Bristol a few months ago - set up with Bullmoose bars* bars, mudguards and racks, a very upright riding position with lovely fillet brazed joints. A bit tatty now, but obviously a nice bit of kit back in the '80s. *I think that's the right term - a one piece bar and stem combo, made from a vertical tube in the steerer with two angled tubes as the forward extension with a wide, sweeping handlebar. I used to want an Overbury's sooo much. The Cross Fell was cool, but the Pioneer was amazing! Me too an' all. But I could only afford a Roockhooper, so that's what I bought. I'm not sure how unusual it it, but the boyfriend is always getting compliments from random people on his vintage 3-speed Puch tourer that he commutes on. Will have to get a photo as it is currently hanging on my wall. I don't like the look of saddle and grips he's put on though, and it now has mismatched brakes because the original front one was broken in a crash. He bought it from an old man who's wife was making him get rid of some bikes, who had kept it in lovely condition for its age. It's a bugger in the rain (chromed steel rims). The other day in Edinburgh I saw a couple on a tandem pulling one of those trailer's for kids to sit in. Nothing unusual there you say....except the back half of the tandem was a normal upright bike while the front half was a recumbent. I've never seen or heard of that before. Wish I'd got a pic. A (foot powered) adult scooter with a larger front wheel (approx 20inches) and smaller back wheel. I'm not sure if it counts as a bike, but it does have 2 wheels and is human powered, and I understand someone completed PBP on one! Hase Pino - google it. 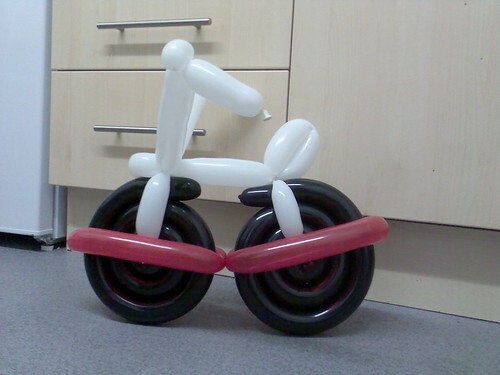 I've seen one in Hyde Park, I was chuffed, pity the riders were so unfriendly. That will be a Hase Pino or Periscop. Amazing machines. Rode one a few times with my 10 year old. 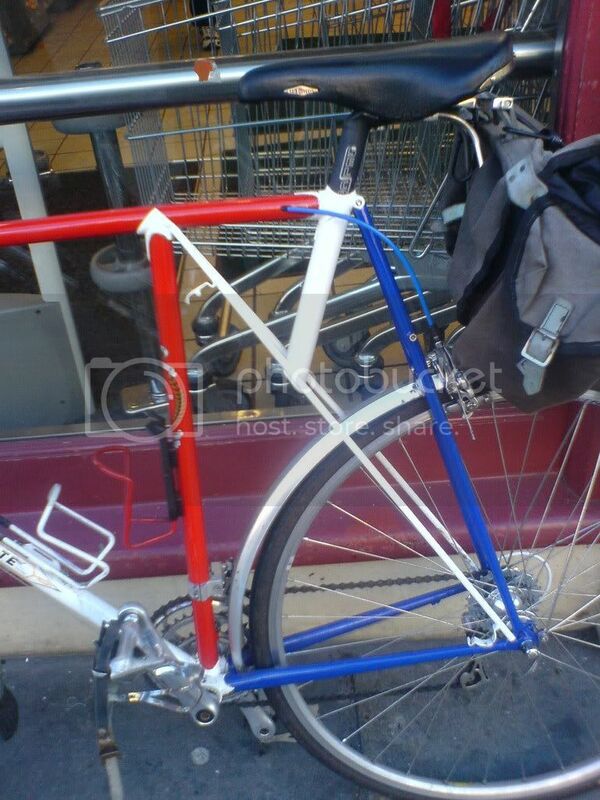 Did the TdF and Hovis FreeWheel on it and it's perfect for Critical Mass. A shitter and a giggler. Hase Pino - google it. Whist stopping to investigate I noticed it had a loose front axle nut. Not having anything to properly tighten said nut and considering it just may be an obscure anti theft technique I contented myself with leaving a warning note secured in the saddle support cable. Want something a little lighter? I'm scared to click on that last one in case I burst it!